The USBG-2X232P1 USB 2-Port Serial Adapter allows 2 new or existing serial devices to be connected through a single USB host port from your Desktop or Laptop. It provides a simple way to add serial ports to any communication expansion scheme. USB to serial connection with 2 additional serial ports. Includes FTDI FT232RL Chips, Mutli-TT USB 2.0 GL852 Chip and ZT213LFEA Zywyn Corporation. Installs without conflict to System IRQ or COM resources. Supports full modem control with RS-232 data signals: TxD, RxD, RTS, CTS, DSR, DTR, DCD, RI, GND. Industrial CoolGear USBG-2X232P1 USB 2-Port Serial Adapter features the best serial converter components, including FTDI FT232RL Chips, Mutli-TT USB 2.0 GL852 Chip and ZT213LFEA Zywyn Corporation Very Fast 921.6K bps UART Chip. Our USB 2-Port Serial Adapter complies to FCC/CE and RoHS guidelines, uses a metal industrial quality shell and UltraFlex USB and Serial Cables for smooth cable placement to equipment. 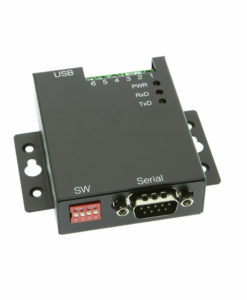 The USBG-2X232P1 USB 2-Port Serial Adapter is designed to make serial port expansion fast and efficient by connecting to a host USB port on your computer or USB hub, instantly adding two RS-232 serial communication ports to your system. Making use of Plug-and-Play utilities with hot plug features the adapter is automatically detected and installed by your system. There are no IRQ & COM port conflicts, since the ports do not require any additional IRQ, DMA, memory as resources on the system. The USB 2.0 Dual Serial Adapter is bus-powered, and it works with the USB host port supplying power of 500mA. 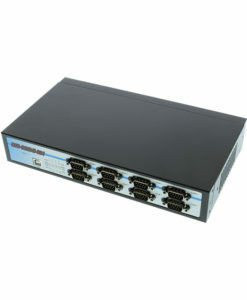 The USB 2.0 Dual Serial Adapter provides instant connectivity with modems, ISDN TAs, PDAs, handheld & pocket PCs, digital cameras, POS, serial printers. It is suitable for remote access, retail and industrial applications, data collection and other applications requiring high speed RS-232 serial communication ports. The USB 2-Port Serial Adapter has certain accessories that work with it. These accessories are what you can order if needed for this hub.